The Holden Commodore (VZ) is a full size car that was produced by the Australian manufacturer Holden from 2004 to 2006 as a sedan, and to 2007 as a wagon and Ute sold alongside the new VE series. It was the fourth and final iteration of the third generation of this Australian made model and the last to spawn a coupé variant. Its range continued to include the luxury variants, Holden Berlina (VZ) and Holden Calais (VZ). Released in August 2004, the VZ series was a minor facelift of the previous VY series that featured a new V6 engine in different tune guises. The powerplants included 175 and 190 kW (235 and 255 hp), 3.6-litre Alloytec V6 engines in place of the older 3.8-litre Ecotec V6. Other changes to the V6 was the loss of the supercharger that was included in the S models from the VT to VY, this was also dropped with the 3.8-litre and would not be used with the new 3.6. These new Alloytec DOHC engines have carried on through to the Holden Commodore (VE) which was released in August 2006. A new 5L40-E 5-speed automatic transmission was introduced on the sports and luxury V6 variants. The advanced 3.6-litre Alloytec engines were more powerful, responsive and fuel-efficient than the outgoing Ecotec V6. To achieve 190 kW (255 hp), the Alloytec V6 gains variable valve timing on both inlet and exhaust sides as well as a dual stage intake manifold, while the 175 kW (235 hp) version retains variable valve timing on the inlet side only. Selected models bring advanced active safety features that electronically assist the driver to maintain vehicle control in emergency situations. The VZ Commodore was available in several model variations, most of which carried over from the VY range, with the exception of the newly introduced SV6, a specification level that replaced the S range. All models in the Commodore range (Executive, Acclaim, Berlina, Calais, SV6, SV8 and SS) were available as sedans, while wagon variants of the Executive, Acclaim and Berlina were available. Berlina and Calais models were not badged or marketed as Commodores. The VZ was the last Commodore line-up to use the Executive and Acclaim nameplates. The VZ is notable for being the only Commodore series of recent times to not officially introduce a Series II update to the range, however, a number of mechanical changes were made in January 2006, designated MY06. Holden introduced the new L76 6.0-litre V8 to its range. The V8 has been slightly detuned, and both Displacement on Demand and variable valve timing have been removed. The base V6 also went from 175 to 172 kW (235 to 231 hp) and the High Output V6 went from 340 to 335 N⋅m (251 to 247 lb⋅ft) at the same time, to meet new ADR 79/01 (Euro III) emissions standards effective from 1 January 2006. Sales of the VZ series failed to match those of the preceding VY in light of rising small car sales, higher fuel prices and growing interest in the whole new replacement, the VE series. The VZ Commodore sedans were superseded by the VE series in July 2006, whilst the wagon and utility ranges lived on for almost another year. VZ Ute production ended in August 2007, whilst the last wagon rolled off Holden's Elizabeth plant line on 6 September 2007. The Executive was the baseline model. Pricing for the Executive started from A$33,160. The VZ series was the last one to include this nameplate, which was first introduced in 1984. The Acclaim sat above the Executive in the specification level hierarchy of the VZ range, and was priced from A$39,050. The VZ series was the last one to include this nameplate, which was first introduced in 1993. The SV6 was the baseline sports variant. Pricing for the SV6 started from A$38,990. 3.6 L 190 kW (258 PS; 255 hp) Alloytec High Output V6. The SV8 was the mid-range sports variant, and was priced from A$41,990. Early VZ versions of the SV8 continued with the VY SV8 theme, being essentially an Executive with a V8 engine, rear spoiler, unique 17 inch alloy wheels and SV6 tail lights. This specification was later upgraded as a running change to match the equipment levels and appearance of the SV6, which remained a step down from the SS. The SS was the flagship sports variant of the VZ range. Pricing for the SS started from A$50,990. The Berlina was the semi-luxury model of the VZ range, it sat above the Acclaim and below the Calais. Pricing for the Berlina started from A$42,900. The Calais was the top of the line, luxury model in the VZ range. It sat above the Berlina and combined luxury with performance. Pricing for the Calais started at A$52,660. The Holden Adventra (VZ) is an all-wheel drive wagon update to the original VY II series model. An interim VZ Adventra appeared in August 2004 at the time of the release of the VZ Commodore range, but this was in essence the familiar VY body with VZ engine, running gear, ECU and a VZ compliance plate. A true VZ series facelift was introduced in February 2005 and with it, the introduction of a V6 engine as the principal power unit. Adventra was now available in a choice of four equipment levels: SX6, CX6, LX6, and LX8, with a 3.6-litre V6 engine affording 190 kW (255 hp) and a five-speed automatic transmission. The V8 engine from the VY iteration was uprated to 250 kW (335 hp), although, now available solely in the premium LX8 model. Production of the V8-powered Adventra ceased in December 2005, due only to the fact that Holden ceased manufacturing the Generation III power unit and did not see a strong enough business case to invest in the new 6.0-litre Generation IV V8 for the Adventra's all-wheel drive application. Sales of the Adventra range never achieved Holden's expectations, especially in comparison to the rival Ford Territory, and it was ultimately phased out of production in 2006 to make way for the newly introduced Captiva, imported from GM Daewoo in South Korea. The Commodore 9C1, or 'Police Pack', was a special pack for the VZ Commodore that was available to all police organisations in Australia, New Zealand and several in the Middle East. It was based on the Commodore Executive with various added specification upgrades to cater for its specific role. Most 9C1s were delivered in white, though unmarked vehicles were offered in other colours. The Commodore Lumina was launched in September 2005. It was based on the Commodore Executive with A$6,000 worth of additional features. 3,700 were produced and sold at a price of A$32,990 each. April 2005 saw the launch of the Commodore Equipe, a Holden tradition for many recent models of the Commodore. Based on the VZ Acclaim with A$5,000 worth of extra features, it sold for A$33,490 AUD. 3,500 were produced. In March 2006, Holden produced the limited edition SVZ model. This was based on the Executive sedan and wagon model with A$6,000 worth of extra features for A$32,990. In March 2007, this model was reintroduced as a run-out model, based on the Executive wagon and base model Ute. The SVZ ute could be ordered in Morpheous (Metallic purple with pink highlights from the VE series). The SVZ wagon included the Police 193kw engine in place of the standard 175 kW (235 hp) engine, as well as leather upholstery and sports additions (dash cluster, leather gearshift and steering wheel). Late in 2005, Holden released 930 units of the limited edition Commodore SSZ. This model featured leather upholstery with SSZ logo, premium performance brakes, colour-coded SSZ instrument cluster, black centre-mounted voltage and oil pressure gauges, 18-inch Monaro-style wheels, Rear Parking Assist and Bluetooth, for A$49,990. The SSZ was discontinued upon arrival of the VE series. Base model Crewman/Ute adopting the specifications of the Commodore Executive. Available with 3.6-litre 175 kW (235 hp) Alloytec V6 – six-speed manual or four-speed automatic. 175kW at engine flywheel, and typically 119-122kW at the rear wheels due to drivetrain losses. The S specification was rebranded as SV6 in August 2006, and the five-speed auto from the sedan became available, with no other changes. The V8 SS received a power increase to 180 kW (241 hp). Based on Commodore SS specification (minus side-impact airbags on cab-chassis). Available with a 5.7-litre 220 kW (295 hp) Gen III V8, or the new 240 kW (322 hp) 6.0-litre L98 – six-speed manual or four-speed auto. The Crewman was also available in a higher spec Cross 8 form, whilst the VZ Crewman Cross 6 was essentially a lower powered, base model V6 version of the Cross 8. To make room in the factory for the upcoming VE series, production of the One Tonner ceased in December 2005. The Ute range continued without any updates for the next 18 months, until the January 2006 addition of Holden's new L76 V8 engines. The VZ Utes remained on sale well after the introduction of Holden's next-generation VE series, as did the VZ Wagons. By December of the same year, the Crewman and all AWD variants of the ute were gone from showrooms after Holden ceased production, and the One Tonner range was discontinued. VZ Utes were superseded by the VE series equivalent released in September 2007. Citing poor Crewman sales & uptake by consumers, Holden chose not to manufacture any long wheelbase "Crewman" crew cab VE ute models in the new VE series. The enhanced performance VZ range sold by Holden Special Vehicles (HSV) was released in 2004 as the Z Series. Its standard range included the models listed below. The Clubsport was powered by the LS2 engine a 6.0 L, 16-valve pushrod V8 producing 287 kW (390 PS; 385 hp) at 6000 rpm and 510 N⋅m (376 lb⋅ft) at and 4400 rpm. There was the choice of either a Six-speed manual or four-speed auto. Fuel consumption was 15.9 L/100 km. The Z-Series started at $61,850 plus on-road costs for the manual. A Clubsport R8 was also available, with greater equipment (e.g. leather seats and extra instrument gauses) and revised wheels design and upgraded braking system. In July 2005, HSV also produced a manual-only Clubsport and Clubsport R8 "Dealer Team Spec" (DTS), comprising Stage 1 and optional Stage 2 packages. Stage 1 included upgraded tyre and wheel package, lighter overall weight and Stage 2 included other upgrades such as enhanced driver interface, adjustable suspension and tyre pressure monitors. The Z Series was the first range with which HSV reached the Middle East with the one-make racing ClubSport R sedans. The Z Series no longer featured the Senator Signature nameplate. The new Senator featured a more subtle styling, with 19 in (482.6 mm) wheels as standard. The engine was a new 6.0-litre LS2 V8 (as featured on the C6 Corvette) pushing out 287 kW (385 hp). Newly designed rear mufflers give the car a slightly deeper sound. The Senator's weight increased to 1,835 kg (4,045 lb), 0–100 km/h (0-62 mph) takes 6.4 seconds and has a top speed of 240 km/h (149 mph) (limited). The fuel economy was officially rated at 10-12 litres/100 km on the highway, and a jump to 18-22 litres/100 km through the cities. Dimensions were 1,450 mm (57.1 in) height, 4,984 mm (196.2 in) length, 1,842 mm (72.5 in) width and the wheelbase is 2,788 mm (109.8 in). Some of the main options included the sunroof $2390, satellite navigation $3800, rear-seat DVD players $3900, Xenon headlights $1800, tyre pressure monitoring system $1395. Inside it features Nappa leather on the seats. The braking system on the Senator comes with ABS with twin-piston front callipers and grooved discs. The specially designed rear suspension has a self-levelling feature, so if the Senator was towing a trailer, instead of the weight forcing the back down and causing the front of the car to go up, the rear suspension would harden itself and therefore keeping the car levelled for headlight aim. This feature is also on the current E-series Senator Signature and has been optioned on Holden models as far back as WH Caprice in 1999. The chrome outline on the grill was added to give the style more of a relaxed luxury appearance. The Senator has specially designed 10 spoke alloys. For the interior special suede leather come as an optional extra. The Senator Signature name has now been dropped out of the line up, in the price department it matches the Clubsport approximately. Nappa leather is standard for the Senator. The 6.0-litre Gen3 (LS2) V8 engine was similar to the C6 Corvettes engine. The brakes are upgraded and feature Bosch ABS. The Avalanche was an all-wheel drive crossover SUV that was manufactured by Holden Special Vehicles (HSV) in 2005. Based on the Holden Adventra LX8 crossover wagon, the Avalanche range also incorporated a dual-cab utility model known as the HSV Avalanche XUV. The XUV derived from the Holden Crewman Cross8. Both HSV vehicles were built in two series, the 2003 "Y Series II" (the wagon was actually available as of October/November 2003) and an updated version of the "Y Series II", which included some of the upgrades found in the newer "Z Series" HSV models. These later models are quite rare, with a build life of nine months from April 2005 to December 2005. As with the related Holden VY all-wheel drive vehicles, the HSV Y Series AWD vehicles as built from September 2004 to March 2005 confusingly have Z Series compliance and Vehicle Identification Numbers; this correlates to the building of new specification Holden VZ and Z Series HSV non-AWD cars during this period. The updated Avalanches with some of the Z Series upgrades can be externally visually differentiated from the Y Series versions by their re-profiled front bumper unit that looks less aggressive and which features a more integrated appearance to the auxiliary driving lights. The Avalanche vehicles were fitted exclusively with the 5.7-litre LS1 V8 engine rated at 270 kW (362 hp) of power and 475 N⋅m (350 lb⋅ft) of torque, mated to a four-speed 4L65-E automatic gearbox. Permanent all-wheel drive was calibrated to deliver 62 percent of the power to the rear wheels, thereby maintaining a rear wheel drive feel to the handling of these vehicles. Along with Holden's V8 Commodore-based AWD vehicles, the HSV Avalanche series was discontinued in late 2005 due to phasing out of the 5.7-litre LS1 engines because of the Euro III emissions regulations. HSV's facelifted Z Series was introduced in October 2004 and featured a new LS2 6.0-litre V8 engine, producing 287 kW (385 hp). Along with the new engine exclusive to HSV, Z Series introduces 19" wheels, Traction Control and Multi-link rear suspension as standard equipment to the Maloo range. In total, the Z Series built were 517 (base) and 958 (R8) and the Z Series MY06 were 181 (base) and 339 (R8). On 25 May 2006, a standard 2006 HSV Maloo R8 driven by Mark Skaife was clocked at an averaged speed of 271.44 km/h (168.7 mph) in the Woomera, South Australia. The speed was recognised by the Guinness World Records representative, Chris Sheedy, as the Fastest Production Pickup Truck recorded. The speed improved over the previous record held by a Dodge Ram SRT-10 at 248.784 km/h (154.587 mph). Senator Skaife Signature: 50 Z Series MY06 units painted in "Phantom Black" with chrome shadow wheel finish, special fittings and automatic transmission only; March 2006. Exports of the VZ sedan were made to the Middle East as the Chevrolet Lumina from 2004 as per the previous VY series. Trim levels were the Lumina LS (based on Commodore Executive), Lumina S (Commodore SV6 with 175 kW), Lumina LTZ (Berlina), and Lumina SS (Commodore SS). As with the previous VY model, exports to Malaysia and Thailand continued in VZ form as the Chevrolet Lumina, sold in LTZ trim (based on the Holden Berlina). Exports ceased during 2005. General Motors do Brasil imported the VZ as the Chevrolet Omega from 2005 to replace the VY-based Omega. This update was announced 9 March 2005. The Brazilian model sold as a single-specification CD model, based on the Holden Berlina with some additional Calais equipment. VZ Omega sales officially ended in 2007 when replaced by the VE-based model, as announced on 4 July 2007. Sales of the VZ Commodore commenced in August 2004. Whilst selling well initially, the launch of the VZ coincided with the beginning of the large car market sales decline, resulting in fewer sales than (some) of its predecessor. Note: Figures include sales of VZ Wagons on until July 2006, but it did remain on sale until 2008. 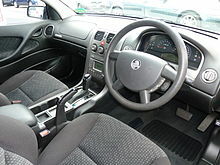 Wikimedia Commons has media related to Holden Commodore (VZ). ^ Skentzos, George (10 September 2007). "Last Commodore VZ Rolls Off The Line". CarAdvice. Retrieved 18 January 2016. ^ "Holden VZ Commodore Executive standard features". Unofficial Holden Commodore Archive. Retrieved 8 December 2006. ^ "Holden VZ Commodore Executive optional features". Unofficial Holden Commodore Archive. Retrieved 8 December 2006. ^ "Holden VZ Commodore Acclaim standard features". Unofficial Holden Commodore Archive. Retrieved 8 December 2006. ^ "Holden VZ Commodore Acclaim optional features". Unofficial Holden Commodore Archive. Retrieved 8 December 2006. ^ Ponchard, Nathan (November 2006). "At last, Holden finds a Seoul mate". Wheels. pp. 106–112. Archived from the original on 27 September 2007. Retrieved 24 May 2007. ^ "AustralianCar.Reviews: #1 for Reviews and Used Car Valuations". australiancar.reviews. ^ "HSV exports". Motoring.com.au. March 2008. Retrieved 22 November 2015. ^ "Walkinshaw/HSV Clubsport R! - V8 Owners car club of Australia forums". forums.v8owners.com.au. ^ "Z-Series Senator". Drive. Retrieved 8 March 2007. ^ a b "20th Anniversary Maloo R8 Brochure". HSV.com.au. Retrieved 11 April 2011. ^ a b c "HSV NEWS". www.hsv.com.au. ^ "Racing spirit celebrated in special HSV models". HSV. Retrieved 25 January 2007. ^ a b "Holden Sets All-Time Vehicle Export Record". Next Car. 21 January 2005. Retrieved 19 December 2014. ^ a b c "Flagships star in GM Holden's export record". Next Car. 1 February 2006. Retrieved 19 December 2014. ^ a b "2006 Best Ever Year For Holden in Middle East". Next Car. 4 February 2007. Retrieved 19 December 2014. ^ "Chevrolet Omega 2005 muito mais potência e luxo" [Chevrolet Omega 2005 more power and luxury] (Press release) (in Portuguese). São Caetano do Sul: General Motors do Brasil. 9 March 2005. Retrieved 19 December 2014. ^ "GM do Brasil lança nova geraçăo do sofisticado automóvel Chevrolet Omega" [GM do Brasil launches new generation of the sophisticated Chevrolet Omega automobile] (Press release) (in Portuguese). São Caetano do Sul: General Motors do Brasil. 4 July 2007. Retrieved 19 December 2014. ^ Pettendy, Marton (7 September 2004). "VFACTS: It's the best August sales ever". GoAuto.com.au. Retrieved 20 July 2018. ^ Pettendy, Marton (9 November 2004). "Record new car sales in October". GoAuto.com.au. Retrieved 20 July 2018. ^ Pettendy, Marton (7 December 2004). "Toyota unstoppable in new car sales race". GoAuto.com.au. Retrieved 20 July 2018. ^ Martin, Terry (8 February 2005). "VFACTS: Sales speed along to record". GoAuto.com.au. Retrieved 20 July 2018. ^ Martin, Terry (15 March 2005). "Holden reclaims top spot". GoAuto.com.au. Retrieved 20 July 2018. ^ Pettendy, Marton (10 November 2005). "One in a million". GoAuto.com.au. Retrieved 20 July 2018. This page was last edited on 19 April 2019, at 17:44 (UTC).